↑ Adams, R.D. and Victor, M., Principles of Neurology, 3rd edn., MacGraw-Hill, New York, 1985. 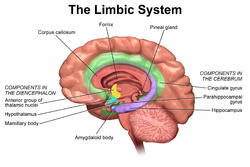 ↑ lversen, S.D., Recent advances in the anatomy and chemistry of the limbic system. In M.R. Trimble and E. Zarifian (Eds. ), Psychophannacology of the Lhnbic System, Oxford University Press, Oxford, 1984, pp. 1-16.